The Heliopan 72mm Vario Neutral Density Filter screws onto the front of your lens and darkens your scene so that you can slow your shutter speed or open your aperture even in bright conditions. Rotating the filter controls the degree of darkness up to 6 stops. This filter is ideal for long exposure photography. 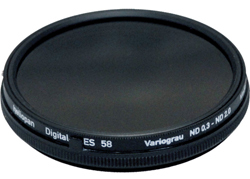 This filter only fits on lenses with front elements that have a 72mm diameter.